We rarely ask “does this make any sense?” of things that are widely accepted as beneficial— or if not beneficial, “the way it is,” i.e. it can’t be changed by non-elite (i.e. the bottom 99.5%) efforts. 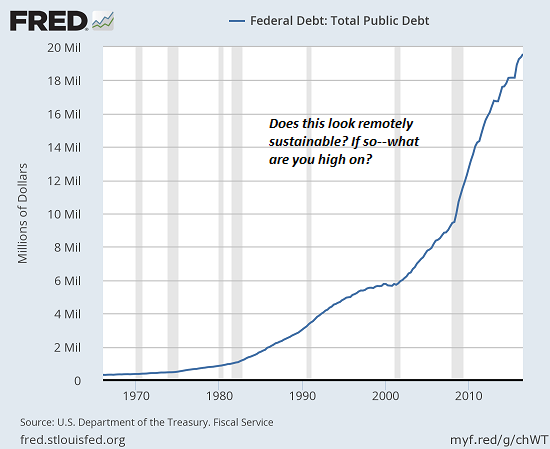 Of the vast array of things that don’t make sense, let’s start with borrowing from future income to spend more today. This is of course the entire foundation of consumer economies such as the U.S.: the number of households which buy a car or house with cash is near-zero, unless 1) they just sold a bubble-valuation house and paid off their mortgage in escrow or 2) they earned wealth via fiscal prudence, i.e. the avoidance of debt and the exultation of saving. Debt has this peculiar characteristic: it has to be paid back with interest.Depending on the rate of interest and the length of the loan, this translates into a mind-numbing reality: borrowing $100 can cost $200 once interest is factored in. One might reckon that people would be cautious about paying two or three times more for something by using debt rather than cash. But consumer economies are based not just on debt, but on TINA (there is no alternative) and on the timeless seduction of getting something now and paying for it later. The higher education debt scam is classic TINA: there is no alternative to borrowing a small fortune to buy a (mostly worthless) diploma, unless you favor living in a cardboard box the rest of your life. Tragically, for a lot of low-income working poor households, there really isn’t any alternative to high-interest debt. When the tire on the gets-me-to-work vehicle blows, the expense has to be financed, either at the tire shop or with a credit card. Equally tragically, fiscal prudence, i.e. the avoidance of debt and the exultation of saving, is not taught in our educational system. As those of us who work in construction know, many blue-collar tradescraft folks earn good pay, but they mis-spend it on needless consumption or over-borrow to buy stuff they could easily live without. I could list dozens of personal histories of earned wealth squandered on painfully frivolous consumption or “investments” that never seem to actually increase the owner’s wealth. What’s not taught in our educational system–perhaps because it would undermine Consumption Funded by Debt?) –is opportunity cost: when you buy the $100 item and end up paying $200 or $300 because the purchase was funded by debt, the opportunity cost is: what else could you have done with the money squandered on interest, penalties, late fees etc.? Pre-easy-credit, people couldn’t borrow money for the simple reason they were poor credit risks. Credit has always existed, but it was generally linked to collateral and / or a transaction that would soon settle the debt in cash, for example, a loan extended by a wholesaler who will get paid off once the end-customer pays. The debtor who has no collateral other than his/her future income has a trick card to play: bankruptcy. Since there’s no real-world asset for the lender to repossess (or in the case of used cars, the repo’d vehicle is typically worth less than the outstanding loan), the borrower can stiff the lender. Does any of this make sense? No. But it’s so darn profitable to the oligarchy, it’s difficult to escape debt-serfdom and tax-donkey servitude. Interestingly, when there really is no alternative, people tend to get creative / innovative. 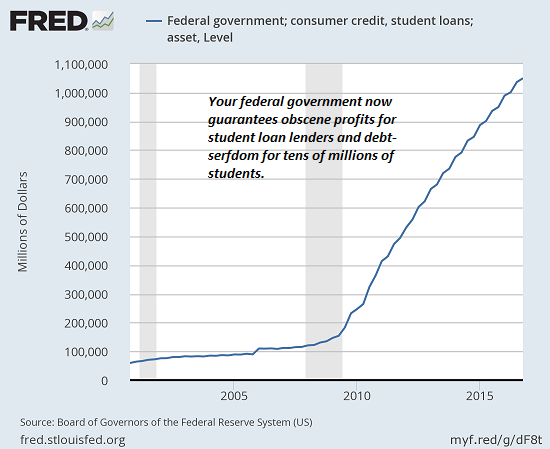 But when easy credit is available, they default to taking the easy way out, which is to borrow from future earnings without questioning the opportunity cost of debt-serfdom and tax-donkey servitude. Future income devoted to paying interest is money that can’t be invested productively. On a national scale, that guarantees falling productivity, soaring wealth inequality and eventually, widespread impoverishment.